This was part of a longer Carson rap in which he talked, as he often does, about the shadowy forces radically changing America into a fundamentally different society–the conspiracy theory he apparently inculcated from Bircher lunatic Cleon Skousen. Perhaps out of frustration Corn emphasizes a joking reference to “many Americans” being stupid, as a qualifier of his more typical statement that Americans aren’t stupid enough to fall for the godless manipulation of the totalitarian Alinskyite conspirators (with whom he has identified Hillary Clinton). 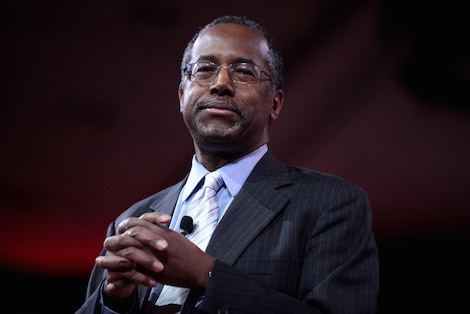 But as we approach voting season, with Carson not only leading most polls but exhibiting (among Republicans, anyway) unearthly approval ratios, the increasingly compelling question is whether GOP voters aren’t hearing The Crazy in Carson’s calm, “common-sense” discourse, or are hearing it and agree.